Habit: Bulb 10--17 mm, ovoid to +- spheric; outer coat red-brown, sculpture 0 or cells +- square, in 2--3 rows basally; inner coats pale brown to white. Stem: 10--37 cm. Leaf: 1, 1.5--2 × stem, cylindric. Inflorescence: flowers 6--75; pedicels 6--20 mm. Flower: (6)8--12 mm; perianth parts lanceolate to ovate, entire, dark red-purple to white; ovary crests 6, obvious, dentate to deeply cut. Stem: 10--20 cm. Inflorescence: flowers 6--35. Flower: perianth dark red-purple; ovary crests finely dentate to deeply cut. Chromosomes: n=7. Synonyms: Allium anserinum Jeps. ; Allium fimbriatum var. aboriginum Jeps. 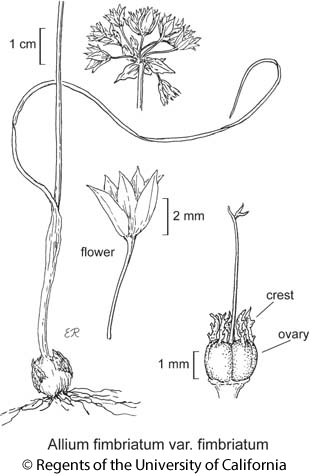 Citation for this treatment: Dale W. McNeal 2012, Allium fimbriatum var. fimbriatum, in Jepson Flora Project (eds.) Jepson eFlora, http://ucjeps.berkeley.edu/eflora/eflora_display.php?tid=53789, accessed on April 26, 2019.
s NCoR, s SNF, Teh, CW, SW, D; Markers link to CCH specimen records. Yellow markers indicate records that may provide evidence for eFlora range revision or may have georeferencing or identification issues. Purple markers indicate specimens collected from a garden, greenhouse, or other non-wild location.